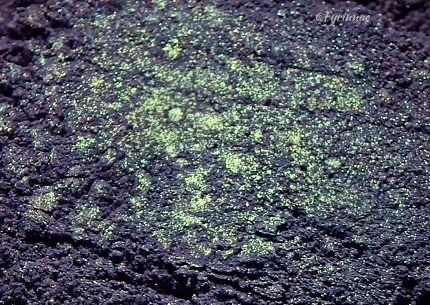 Medium cool violet topped with a vibrant highlight of varying green hues (shimmer, not sparkle). Appears to be dull violet shades in the jar, but shows true upon application. Not lip-safe. Swatch applied over diluted Pixie Epoxy. As this is a matte-base shadow with no sparkle, it will not work well over full strength Pixie Epoxy, which is only intended to hold sparkle in place.Regular primer is recommended.